Eco Advance Heat Interface Units | Pak Plant Ltd.
water and indirect space heating. 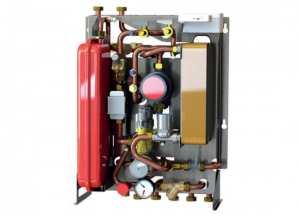 The HIU will provide hydraulic separation between the domestic hot water (DHW), space heating circuit and the primary low temperature heating system via a pair of stainless steel brazed plate heat exchangers. Primary water flow to the hot water and heating plates is regulated by a pair of fast acting electronic pressure independent control valves under the control of a programmable electronic controller. The unit is able to achieve DHW temperature from the plate within 10 seconds. All components are housed within a fully insulated enclosure measuring 640mm high x 490mm wide x 271mm deep and have a thermal loss of no greater than 50 Watts. Electronic pressure independent control valves. Hot water priority within 3 seconds. Compact stainless steel heat exchangers. Very low standby losses (less than 50 watts). Two DHW options, Comfort and Eco modes. Direct volt free connection for external enable signal. Domestic hot water return pump within the unit housing (optional). Programmable heating supply temperature range. Optional programmable heating return temperature limiter.